We’d love your help. Let us know what’s wrong with this preview of A Martian Odyssey by Stanley G. Weinbaum. A Martian Odyssey is a science fiction short story by Stanley G. Weinbaum originally published in the July 1934 issue of Wonder Stories. To ask other readers questions about A Martian Odyssey, please sign up. This short story by Stanley G. Weinbaum proves that it is not about the number of pages or words in a story/book - what matters is the passion and potency of the imagination! 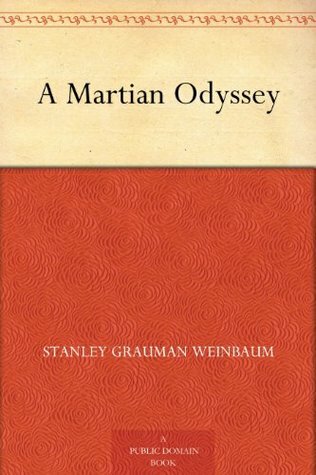 In about 30 pages, Stanley G. Weinbaum takes you to Mars and then on an amazing journey. 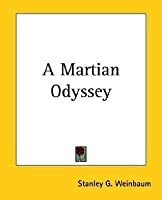 First published in 1934, A Martian Odyssey is about one of the experiences of the famous crew of the Ares expedition - the first human beings to set foot on the mysterious neighbor of the earth, the planet Mars. A science fiction classic This short story by Stanley G. Weinbaum proves that it is not about the number of pages or words in a story/book - what matters is the passion and potency of the imagination! An astronaut on Mars got separated from his crew members after he wrecked his rocket and has to take a long and perilous walk back to safety and his mother-ship. If this sounds familiar and reminds you of The Martian , you’re not mistaken. There are indeed quite a few similarities between the two stories, and I wonder if Andy Weir took some inspiration from Weinbaum’s work. Stanley G. Weinbaum’s short story first got published in 1934 in a science fiction magazine called Wonder Stories. Although An astronaut on Mars got separated from his crew members after he wrecked his rocket and has to take a long and perilous walk back to safety and his mother-ship. Stanley G. Weinbaum’s short story first got published in 1934 in a science fiction magazine called Wonder Stories. Although it has some pulpish elements to it I have to say that I was pleasently suprised by the depth of the characters. There are five of them (four humans, one alien) and each develops his own traits on the rather limited space of only thirty pages. The most interesting one, apart from the main protagonist Jarvis (the “Mark Watney” of the story), was the alien named Tweel. You have to imagine him as some sort of intelligent ostrich. Opinions differ on how intelligent he actually is. He only learned six or seven words of human language, but can express a great deal with this limited vocabulary. Jarvis and Tweel soon become sort of friends: “[…] it was just that we were somehow mysteriously different—our minds were alien to each other. And yet—we liked each other!" But there are also some odd creatures, the antagonists if you will, whose mantra, “We are v-r-r-riends!”, is better not believed. Considerung the year of publication, it seems quite obvious to me that with these so-called mud-creatures the bad Germans, the Nazis, are characterized. Interestingly enough there is also a good German among the ship’s crew, the engineer Putz, who is talking in the typical German accent. Weinbaum’s writing is very efficient and I would like to read more of his stories. Too bad he died so young (one and a half years after this story was published; at the age of 33). At least there is a sequel to this one, called Valley of Dreams which I’m now eager to read it. Wonderful to read an 84-year-old SFnal representation of *truly* alien consciousnesses, explicitly made to be so by the author. It was hokey to have a Mars setting, but 84 years ago not quite as hokey as it would be today. I loved this book! It may be in part due to the fact that the last two titles I finished kind of blew. Or maybe because I read it in a waiting room and it managed to make me laugh out loud. Not LOL, but for real, with sound, laughing out loud, in public, in an otherwise quiet place. I made the mistake of reading a few bad reviews. This little tome was written in 1934 and when you keep that in mind as you read, it is so much more entertaining that it would be if written now. Our narrator is a pret I loved this book! It may be in part due to the fact that the last two titles I finished kind of blew. Or maybe because I read it in a waiting room and it managed to make me laugh out loud. Not LOL, but for real, with sound, laughing out loud, in public, in an otherwise quiet place. I made the mistake of reading a few bad reviews. This little tome was written in 1934 and when you keep that in mind as you read, it is so much more entertaining that it would be if written now. Our narrator is a pretty full of himself astronaut that has encountered other life on Mars. His telling of his adventures is just too funny. He explains the attempts at communication and empathy and actually makes a friend of sorts. In general I do not mind "classic" SF. Although the current times may have overtaken their technology dreams, some of the concepts and questions are still valid (see Asimov's laws of robotic). This short story is addressing the different nature of alien life. Other than e.g. in Stanislaw Lem's Solaris it is done in a wild west like style, and the main character is of course American. He tells about his encounters with different lifeforms on Mars in a colloquial language, which is not appropriate In general I do not mind "classic" SF. Although the current times may have overtaken their technology dreams, some of the concepts and questions are still valid (see Asimov's laws of robotic). This short story is addressing the different nature of alien life. Other than e.g. in Stanislaw Lem's Solaris it is done in a wild west like style, and the main character is of course American. He tells about his encounters with different lifeforms on Mars in a colloquial language, which is not appropriate to scientists in an international team. I had the same problem already with Andy Meir's "The Martian". There are also some factual mistakes. While Weinbaum may not have known that the atmosphere of Mars in not breathable, he should be aware, though that the Earth seen from Mars (as in inner planet) can never be seen in the zenith. Lo que nos cuenta. Seis relatos del prematuramente malogrado y no demasiado conocido autor, mayoritariamente de Ciencia-Ficción y que tocan, entre otros temas, el extraño y peligroso ecosistema venusiano, las matemáticas para escapar de un loco homicida, una isla con criaturas extrañas, la exploración de Marte y una mujer con capacidades metahumanas. Relatos escritos entre 1934 y 1936, varios publicados de manera póstuma, y editados en diferentes antologías y recopilaciones a lo largo de los años. Mükemmel. Her bilimkurgu sever okumalı. Think not what you can do for Mars, think only what Mars can do for you. (Sigh!) Yes, this is colonialist, imperialist and racist in equal measure, yet it's probably not fair to condemn it for that since it was Written in 1934 and is of its time. It would be cruel to review it through the lens of 2014 because it simply doesn't stand up. A expedition to Mars which Weinbaum imagines as a dry desert with thin but breathable air and low gravity. It has plants and creatures consistent with the world Think not what you can do for Mars, think only what Mars can do for you. (Sigh!) Yes, this is colonialist, imperialist and racist in equal measure, yet it's probably not fair to condemn it for that since it was Written in 1934 and is of its time. It would be cruel to review it through the lens of 2014 because it simply doesn't stand up. A expedition to Mars which Weinbaum imagines as a dry desert with thin but breathable air and low gravity. It has plants and creatures consistent with the world and Weinbaum's imagination is not lacking. One of the expedition members is separated from the others and this is his recounted story about his (first contact) meeting with a sentient alien, an ostrich-like being, Tweel, who manages to learn half a dozen words of English and communicate quite complex concepts, but at the end of the encounter human and Martian are no closer to understanding each other than they were at the beginning. This is what lifts it to two stars in my opinion, because the rest of it, (the journey across Mars) is largely first-they-did-this and then-they-did-that. The interest lies in Jarvis and Tweel's attempts at communication. Sadly there is no attempt to understand a third race which is quite benign until Jarvis steals the egg-like-thing which seems to be the focal point of their civilisation. Why? Because he can and because he believes it may be a powerful healing device. There's no concept of leaving well alone. No theft-is-wrong. No Prime Directive. Mars is there to pillage for whatever the humans can appropriate. This is interesting only from a historical perspective. gerçekten genç yaşta seni kaybettiğimiz için çok üzüldüm Stanley! keşke uzun ömürler yaşayıp bize bu öykülerin gibi mükemmel eserler okutma fırsatı sunsaydın. sen harika bir yazarsın! ve harika bir meslektaşsın ve bunun izlerini her bir satırda hissettirdiğin için mesleğime bir kez daha mutlulukla bağlandım. No conocía a este autor, pero navegando en los podcast de ivoox en una de mis suscripciones, me apareció este cuento de ciencia ficción, y para variar decidí darle una oportunidad. Y no me he arrepentido, al contrario, esta es una de mis lecturas favoritas del año. Tenemos un viaje a marte, y una gran aventura cruzando las distintas zonas del planeta narradas por el personaje principal, Jarvis, quien conocerá distintas criaturas en este planeta misterioso. He de decir que disfruté mucho con cada No conocía a este autor, pero navegando en los podcast de ivoox en una de mis suscripciones, me apareció este cuento de ciencia ficción, y para variar decidí darle una oportunidad. Y no me he arrepentido, al contrario, esta es una de mis lecturas favoritas del año. Tenemos un viaje a marte, y una gran aventura cruzando las distintas zonas del planeta narradas por el personaje principal, Jarvis, quien conocerá distintas criaturas en este planeta misterioso. Very nice, sort of funny, old fashioned. 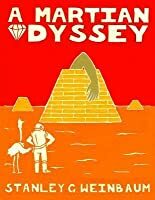 A Martian Odyssey by Stanley G. Weinbaum (1934) was a lot of fun. It deals with life on other planets, this time (as so often back then) on Mars. What I liked about the story was that it was open for different form of life (not just carbon based lifeforms) and it dealt with interesting aspect of language. It also shows the limitless faith people had in science and what we could find in space. The story is out dated but it is still very charming and entertaining. A quirky little story that is far from Weinbaum's best, it has some interesting allusions in terms of life on Mars. Some of the characters are annoying, the story's pretty much told in flashback, so it got a bit confusing here and there. Nothing insurrmountable, but the tale's not one I'd go out of my way to recommend to anyone. Un excelente libro para iniciar la lectura de ciencia ficción. Las historias son tan originales y bien contadas. Me gustó mucho como para recomendarlo a cualquier lector independientemente de su preferencia en género literario. A fascinating look at the starts of modern science-fiction. Imaginative in setting and scope; comfortingly formulaic in plot. Would have given it 4 stars but the echoes of early 20th century views on race (in only one paragraph though) were jarring and stayed with me after reading the story. This was a fun read, but dated. I do not know much about this story or the author, but this seemed to be a small part of a larger story. Some stories may have some loose ends; this is nothing but loose ends! This was a short fun read – the story is of how two new friends, one human and one of Mars, address communication challenges as they try and get out of a tricky spot. It’s not until the end that we learn what put them in danger, and throughout the story makes subtle remarks on being human. Fun travelogue of strange creatures on Mars that are genuinely alien. Dette er en novelle om en astronaut som opplever at romraketten han bruker til å drive rekognosering over store ørkenområder på Mars, havarerer. Han må som en følge av dette benytte seg av de små restene av forliset og sitt øvrige utstyr til å gå den lange veien tilbake til basen, hvor hans tre kamerater venter på ham. På sin reise møter han mange forbløffende ting, og det er her Weinbaums fortelling har sin store styrke. A Martian Odyssey er en oppvisning i livlig fantasi, og noen av karakterene Dette er en novelle om en astronaut som opplever at romraketten han bruker til å drive rekognosering over store ørkenområder på Mars, havarerer. Han må som en følge av dette benytte seg av de små restene av forliset og sitt øvrige utstyr til å gå den lange veien tilbake til basen, hvor hans tre kamerater venter på ham. På sin reise møter han mange forbløffende ting, og det er her Weinbaums fortelling har sin store styrke. A Martian Odyssey er en oppvisning i livlig fantasi, og noen av karakterene - særlig den berømte Tweel - er veldig fornøyelige, mens andre igjen er der nesten bare for å være der. Forfatteren tar opp et par interessante emner, og med tanke på hvilken tid novellen ble utgitt, er det lett å trekke paralleller til samtidens politiske strømninger. Språket er presist og lett å følge, men er snarere mer generelt og pregløst enn å ha noen egen "personlighet"; det er slik jeg kan tenke meg språket er i de fleste andre science fiction-historier. Etter hvert som fortellingen går sin gang og ting begynner å floke seg, kan man fort se hvor det hele bærer hen, og avslutningen er altfor lettvint. Stanley Weinbaum yaşasaydı muhakkak gelmiş geçmiş en sevilen bilimkurgu yazarları listesinde başı çekerdi. Kitabın detaylı önsözü bu şekilde bitiyor. Isaac Asimov'dan böylesine bir giriş kitaptan beklentiyi haliyle arttırıyor. Yazar bu öyküleri yazdıktan 1 yıl sonra ölmüş ve maalesef başka bir kitabı da yok. O yüzden hiç acele etmedim okurken. Öyküler hep farklı konuları içeriyor. Mesela yarattığı dünya dışı yaratıkları çok zekice tasarlamış ve ayrıntılı özellikler vermiş. Ve o yaratıkların bölü Stanley Weinbaum yaşasaydı muhakkak gelmiş geçmiş en sevilen bilimkurgu yazarları listesinde başı çekerdi. Kitabın detaylı önsözü bu şekilde bitiyor. Isaac Asimov'dan böylesine bir giriş kitaptan beklentiyi haliyle arttırıyor. Yazar bu öyküleri yazdıktan 1 yıl sonra ölmüş ve maalesef başka bir kitabı da yok. O yüzden hiç acele etmedim okurken. Öyküler hep farklı konuları içeriyor. Mesela yarattığı dünya dışı yaratıkları çok zekice tasarlamış ve ayrıntılı özellikler vermiş. Ve o yaratıkların bölümlerini okuduğunuzda özellikle tiplemeleri birçok öyküye, filme ilham olduğu çok açık. Bir diğer hikayede VR gözlüğün benzerini tasarlamış ve mükemmel bir fantastik-bilimkurgu hikayesi çıkarmış ortaya. Uyumun Doruğu hikayesi, süper insan/mutant fikrini öne sürmüş ve yine üst düzey. 7 hikayenin ilk ikisi Bir Mars Destanı'nı konu alıyor. Son iki hikaye yine birbiriyle bağlantılı ve Profesör Van Manderpootz ile bahtsız Dixon Well'in öykülerini anlatıyor. İki öyküden Eğer Dünyaları mükemmel bir hikaye. Birde şu var, yazar kesinlikle aşk acısını baya çekmiş. Bu son iki hikayede çok belli :-) Kısacası şöyle söylemem lazım, sadece 1.5 yıllık yazarlık kariyerinde bu kadar az hikaye yazıp bu kadar çok etki bırakmak bence büyük başarıdır. Öyküleri, yaratıkları hep filmlere ve romanlara ilham olmuş. Kim bilir yaşasaydı daha neler neler yazardı demeden edemiyorum. “Imperturbable” = incapable of being upset or agitated; not easily excited; calm. The main character, Jarvis, is musing about his past girlfriend back on Earth. To his surprise he sees her on Mars! But it's an alien creature using the prey's mental images to create an illusion and hypnotise to lure the hapless victims. Similar alien technique (not as malevolent) as in Ray Bradbury's “September 2005: The Martian” (1949), and Stanisław Lem's “Solaris” (1961). The title story, the 1934 "A Martian Odyssey," is one of those original "classics" about which the SF reader always hears, such as, A Martian Odyssey by Stanley G. Weinbaum has some of the occasional creakiness to be expected of Golden Age science fiction--conventions of the era, really, rather than actual true authorial failures--but for its period of the mid-1930s this book of five stories does indeed show a great deal of innovative imagination, and of course quite decent storytelling as well. Ich habe mir dieses dünne Büchlein auf dem Garching Con gekauft. Es enthält die zwei Marskurzgeschichten um die "Ares" von Stanley G. Weinbaum, von denen die erste die bekanntere ist, weil sie auch in die "Science Fiction Hall of Fame" Sammlung aufgenommen wurde - als älteste Geschichte in dieser berühmten Sammlung. Beide Geschichten lassen sich noch gut lesen: Weinbaum gelingt es sehr gut, fremdartige Lebewesen, Städte und Landschaften zu schildern. Das Alter von etwa 80 Jahren merkt man der Erzä Ich habe mir dieses dünne Büchlein auf dem Garching Con gekauft. Beide Geschichten lassen sich noch gut lesen: Weinbaum gelingt es sehr gut, fremdartige Lebewesen, Städte und Landschaften zu schildern. Das Alter von etwa 80 Jahren merkt man der Erzählung allerdings insbesondere bei der Beschreibung der Marsexpedition selbst und der Rakete an. Gestört hat mich die Art, wie er die Geschichte aufbaut: die Rückkehrer erzählen jeweils von ihrer Expedition, womit schon einmal klar ist, dass sie zurückkehren. A precursor to The Martian? There is something about Mars, it seems, that lends itself to humorous, self-deprecating observations. Weinbaum offers a tale that brings to the fore every hypocrisy and prejudice of the invader and then sets them on their head... Well nearly. Somehow, the humour is in the way assumptions of superiority, improbability and impossibility are expressed by Jarvis and his fellow crew mates. Given the level of obvious disdain and condescension, the biggest threat seems to b A precursor to The Martian? There is something about Mars, it seems, that lends itself to humorous, self-deprecating observations. Weinbaum offers a tale that brings to the fore every hypocrisy and prejudice of the invader and then sets them on their head... Well nearly.